At long last, DENOUNCEMENT PYRE are about to unchain their highly anticipated third album, Black Sun Unbound. Three years have passed since the release of their critically acclaimed Almighty Arcanum, which saw these long-running Aussie tyrants evolving well beyond their blackthrashing beginnings and locate a near-perfect balance between aggression and atmosphere. 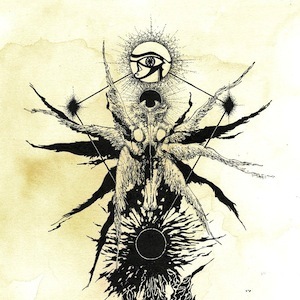 With Black Sun Unbound, DENOUNCEMENT PYRE have perhaps found the balance - between not only aggression and atmosphere, but passion and poison, power and patience, sheer vengeful violence and spiraling night-sky melodicism - in the process delivering a potently BLACK METAL record which emphasizes both titular elements of that genre. In fact, the album title itself bespeaks the brilliance brimming from the band here, as each of these ten tracks spills forth a blinding sensation of absolute occult energy, each distinct track distilled into a greater, wholly diabolical totality. Further evidence of such is compounded by the song titles, as well: among them, "World Encircler," "Transform the Aether," "Deathless Dreaming," and the telltale "Revere the Pyre." Fittingly, the production is clear and cutting without sacrificing an ounce of grit on which DENOUNCEMENT PYRE have built their throne these past 13 years. With the power-trio set to perform their first North American live ritual at this year's Maryland Deathfest, there's no better time to behold Black Sun Unbound!